Yesterday Werner Herzog premiered his latest, “Queen of the Desert,” at the 65th International Film Festival. It marked a wonderful occasion to see the legendary German filmmaker in the flesh and on his home turf. “Queen of the Desert,” Herzog’s first narrative film since the 2009 drama “My Son, My Son, What Have Ye Done?,” stars Nicole Kidman as a Gertrude Bell, a brilliant woman who, along with T.E. Lawrence (of “Lawrence of Arabia”), was a highly influential figure in English foreign policy, and most known for assisting in the creation of today’s Iraq. James Franco, Robert Pattinson and Damian Lewis also star in the biographical epic. In honor of the film’s world premiere, Indiewire sat down with the iconic filmmaker to talk about his interest in the project, working with Nicole Kidman and how he’s managed to maintain such a successful, diverse career for so long. This is your first narrative in a while. No. No. No. Let me put it this way, I think in the last ten years I have made five narrative feature films. And that’s a good average. But of course I’ve made quite a few more documentaries and I’ve acted in films too — as a villain, for example. And I have founded my rogue film school and have been a voice in one of “The Simpsons” episodes. And on and on. I’ve also done an art installation for the Whitney Museum. It’s just not that you could say I haven’t made feature films for a long time. Name me one of the Hollywood directors who has made five feature films in 10 years? Good point. I basically wanted to know why you chose this as your latest project? It’s not that I sit there and plan a career. It’s more like very often films come at me with a great vehemence. And I didn’t even invite them. I have never planned my career thinking “What should I do next?” It’s like burglars in the middle of the night. You wake up at three in the morning and something is stirring in your kitchen. And there are five burglars. And one of them comes with great vehemence at you so you better deal with that one first. That’s how my films come at me. So what made this film the burglar you wanted to deal with now? Because, when I saw the letters and diaries of Gertrude Bell, hearing her voice and reading her voice, I immediately knew this was big. It was so big that I had to accept this challenge. And the vehemence in which this great figure came at me was what decided everything. And at yesterday’s press conference you mentioned that this film has made you want to make more films with female protagonists. Well, we have to be cautious because the strange thing is I made this film and only afterwards, and now here at the Berlin Film Festival, people say, “It’s the first time you’ve made a film about a female protagonist.” I didn’t even notice. I was not aware of that. I then thought, yes I could have or should have maybe done one decades ago. Some films about female protagonists, which I actually have done in documentaries like “Land of Silence and Darkness”—probably the deepest film I have ever made. But it’s a documentary. Or “Wings of Hope,” about a great, wonderful woman who crashed in a plane and was the only survivor out of 96 and got out of the jungle on her own. So, yes, I didn’t even notice that I had not made a narrative feature film about a woman before. I was not aware I was going to do a film about a female protagonist. It didn’t really matter. But sometimes you have directors like Antonioni, who was very good with women. Or Bergman. Of course great male figures also, but why did he make films mostly about women? I think neither one of us could give you a very eloquent answer. My next feature film is with all probability about a female central character, but not because I’m planning now to shoot with women. 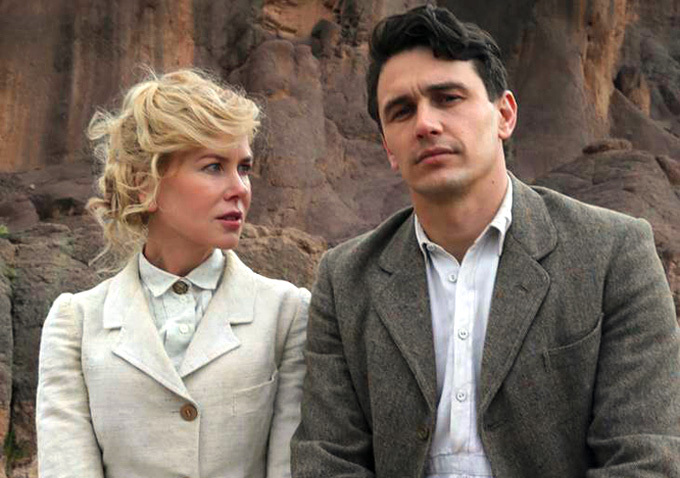 In “Queen of the Desert” landscape and scenery play such a huge role for Bell. That’s clearly something evident in your works — narrative and documentary. Was that a huge reason why this project became important? No. It was a natural concomitant that the desert and the dignity of the life of the Bedouins and the beauty of their poetry and so on came into it. In our case, landscape is like an inner landscape, something that is deep in Gertrude Bell’s soul. The landscape of the soul. The same thing with the jungle. The jungle is a place of fever dreams and it’s the place of grand opera. So these landscapes become part of a leading character. They are not just a backdrop. They are part of their inner life so that’s how I understand landscapes. Looking at the consequences of Bell’s work on the Middle East today, was that something you considered when looking at the area today? Did that ever worry you? I had no worries, but of course very recently after the film was shot we had the phenomenon of the Islamic State. Of course, today it is easy to say what Gertrude Bell and others—the French and the British—have carved. We know that. At the same time though, we do see the alternative. We see it practically on the ground. The Islamic State, which denies all borders because they want to establish a caliphate where there are no borders, which includes Lebanon and Israel among others. And there you’ve got the first problems already. It includes Saudi Arabia and the entire Muslim world, ultimately. But when you look from that perspective, you start to partially sympathize with the status of the state it was created in after the collapse of the Ottoman Empire. You handle the cultures depicted with such sensitivity. Because yesterday night at the world premiere of the film, in the middle of the film, a heckler, I mean a very disturbed man, stands up and starts yelling “You are sympathizing with Islam. To hell with you!” And walked out. So yes, there is a demonization of Islam, which I do not follow. The film also doesn’t do it. Of course, there are really perturbed people out there at the moment, and you see it in France and in Germany with marches. It projects an Islamophobia. In a way, the film comes at the right moment. But it’s not planned. It’s a coincidence. I also wanted to discuss the casting. On paper, it just seems a little bit unconventional. You have an American actor playing someone English. And then Nicole Kidman having to play someone much younger at one point. How did you go about casting this?First of all, I think I’m good at casting and that’s a very decisive part of what I do. And Nicole Kidman is the ideal. She gives a performance that is unprecedented. I have not seen anything like this at least in a whole decade from any actress in any film. So it’s of a phenomenal caliber. It’s easy to say you take a star that has a certain market value… No it’s not like that. There has to be chemistry. If there is no texture between actors, you end up with a stillborn baby. And her texture with James Franco and the chemistry with Damien Lewis, I knew it would work. And it does. That’s a key to casting. You’ve been working so consistently for a long time, how have you been able to do that? Well, I’m not in the culture of complaint. I started out when no one wanted to finance my films. I earned my own money. I worked as a welder and I worked the nightshift at a steel factory while I was still in high school. I worked the nightshift every night and I earned my own money to start with 35mm celluloid film. Short featurettes. And it’s the same attitude today. I know how to deal. I know the value of money and I always put the films on budget, on the table. Sometimes under budget. For example, “Bad Lieutenant” was slightly under budget. And that’s one side. I’m responsible. Secondly, I think all the actors, all the stars included, wanted to work with me because I know they will be at their best. [Klaus] Kinski knew it and Nicolas Cage knew it. Well pretty much everyone. Christian Bale; he knew he would particularly good. That’s a factor that keeps me moving, but it’s not that it’s a coincidence. It’s a long series of films that I have made where everybody can see the actors are at their best.